A senior Iranian military leader warned this weekend that “all U.S. military bases in the Middle East are within the range of” Iran’s missiles and emphasized that the Islamic Republic will continue to break international bans on the construction of ballistic missiles. Much of this missile work, like the details of Iran’s advanced arsenal, remains secret, according to Brigadier General Amir Ali Hajizadeh, commander of the Iranian Revolutionary Guard Corps Aerospace Force. Hajizadeh dismissed the threat of military action by the United States, warning that all U.S. assets and allies are in range of Iran’s current missile arsenal, according to comments made Sunday in Tehran and recorded by Iran’s state-controlled Fars News Agency. 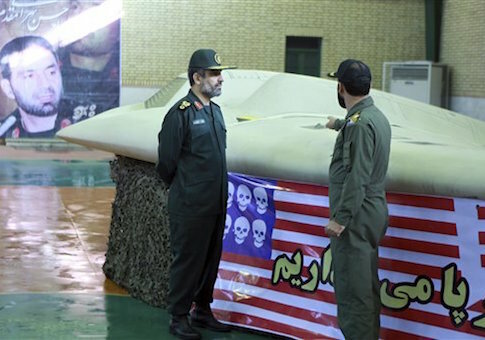 The threats of attack on the United States were issued as Iran unveiled new high-tech torpedoes and the formation of a joint war room along with Russia, Syria, and Iraq. “Some of the threats by the U.S. are aimed at appeasing the Zionists, while others are for the purpose of domestic consumption (in the U.S.), but what is important is that they are aware of and acknowledge our capabilities and deterrence power,” Hajizadeh was quoted as saying. “We do not feel any need to increase the range of our missiles and (our perceived enemy) targets are fully within the range of our missiles,” he added. Iran will not slow down the research and construction of advanced missiles, the IRGC leader said, despite international bans on such action. “We do not see any restriction for our missiles and the IRGC’s preparedness and missile drills are conducted without a halt and according to our annual time-table, but only some of them are publicized through the media,” Hajizadeh said. “The U.S. is obedient and passive in the Persian Gulf and we impose our sovereignty right in the Persian Gulf very powerfully,” Fadavi said. Iran’s renewed war rhetoric and anti-U.S. posturing comes amid reports that Iran and Russia have taken the lead in Syria, where both countries are working to bolster the embattled President Bashar al-Assad. A senior Iranian official disclosed over the weekend that Iran, Russia, Syrian, and Iraq are working on forming a joint war room to coordinate operations in the region. The so-called “information exchange center” would be the first step in formalizing a joint operations center to coordinate military efforts in Syria and elsewhere, according to political adviser to Iraq Mohsen Hakim, head of the country’s Islamic Supreme Council. “The information center has been formed some days ago after six months of discussions,” Hakim was quoted as telling Fars. Information obtained by this operations center would be disseminated to officials from each participating country, according to Hakim, including the Russian and Syrian armies. “Hakim underlined that the information center can be a preliminary step to set up a joint operations room or Centcom,” Fars reported. Meanwhile, Iran unveiled a new high-tech torpedo that it claims can hit targets both in and out of the water. The technology for the missile has been borrowed from the Russians, according to Iranian officials who spoke to Fars.